1. 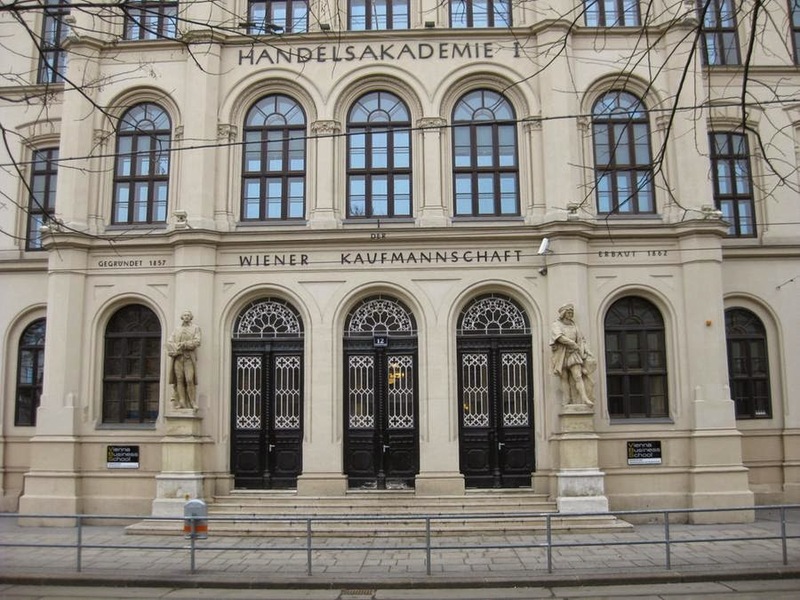 The Entrance of the Vienna Business School (Handelsakademie I der Wiener Kaufmannschaft, 1862) has two statues: Adam Smith to the left and Columbus to the right, standing, with a map showing the Americas in his left hand, to which he is pointing with his other hand. Description from wien.gv.at: Standbild aus Stein (mit Schiffsgeräten) von Josef Cesar (Wiener Akademie der bildenden Künste) für den Entdecker Amerikas (1492). 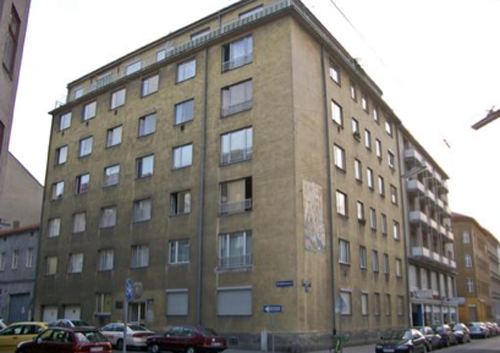 Location: Wien 1, Akademiestraße 12. Across Karlsplatz next to Brut. 2. Façade statues at the Museum of Natural History (Naturhistorisches Museum), 1880s. One of the 108 historical figures represented —all men. Columbus is next to Fernão de Magalhães and Vasco da Gama. "10 statues in niches: devoted to the discoveries and the events of the world, indicating that have suddenly expanded the horizon of observation and knowledge, 34 statues on the balustrades, 64 heads: the personal moments of progress, represented by the chronological sequence of statues of great men, of will and inquiry". Sculptor: Anton Schmidgruber (Wiener Akademie der bildenden Künste). Location: Wien 1, Burgring 7. 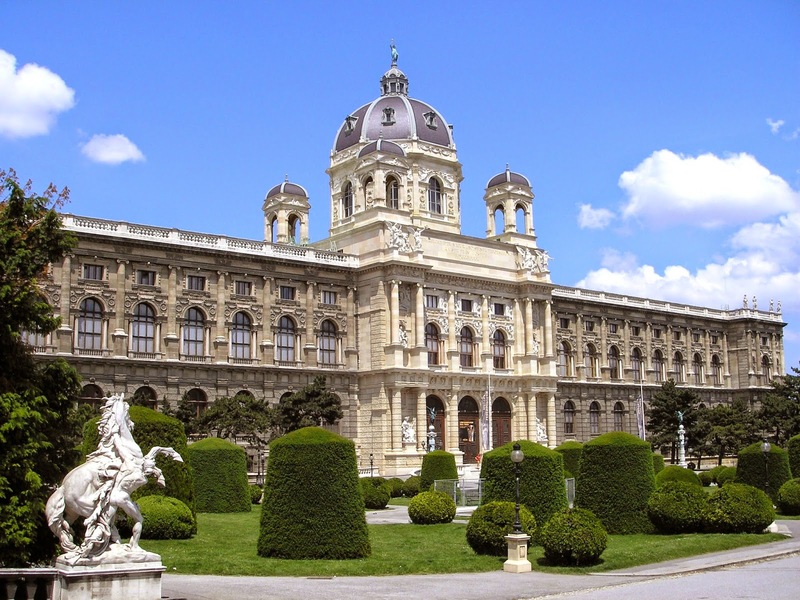 Naturhistorisches Museum. 3. 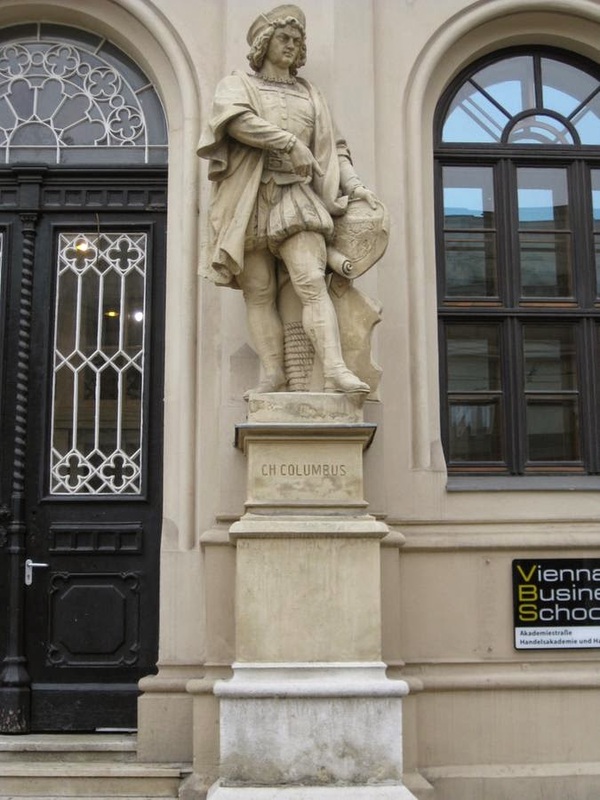 Columbusgasse (4, Wieden; since 1874: 10 Favoriten), named after Christopher Columbus on December 1, 1864 by the District Committee Wieden. Implemented the 5 July 1894 on the Inzersdorfer Canongasse and part of the Neuburgergasse (September 9, 1969 Council Committee for Culture (Gemeinderatsausschuss für Kultur). 4. 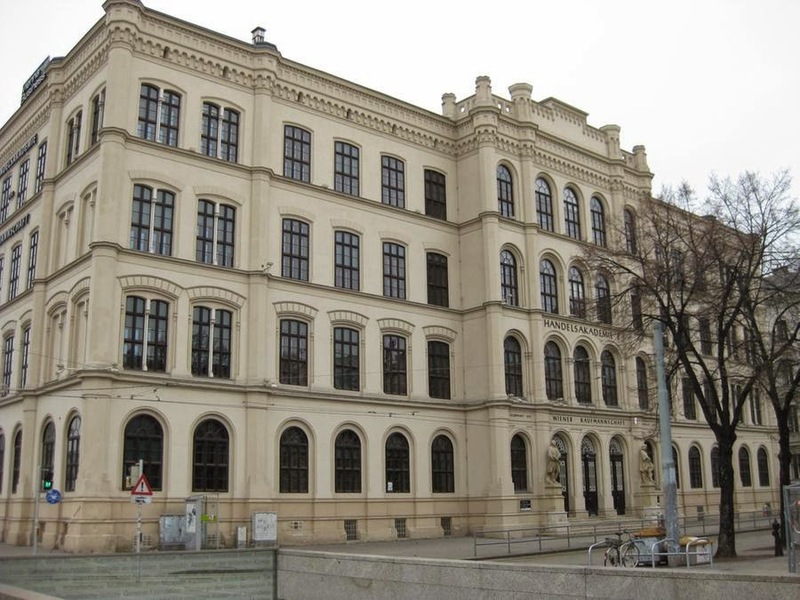 Columbushof (1892) by the architects Josef and Anton Drexler (Akademie der bildenden Künste Wien) and thoroughly renovated in 1983. 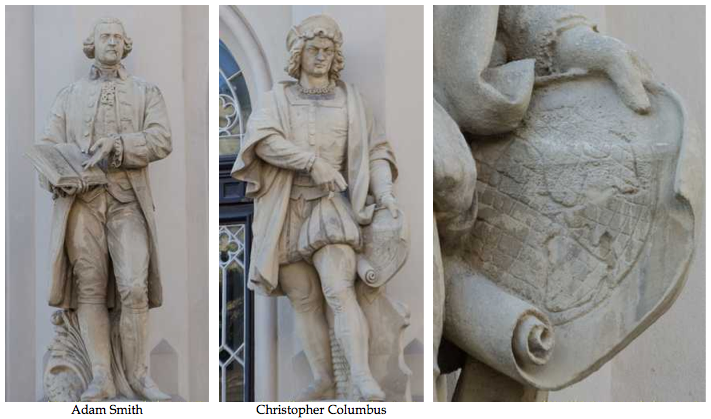 In the middle of the building there is relief medallions representing Columbus and the English Francis Drake. The entrance is flanked by atlases. Location: Wien 10, Columbusplatz 6. 5. Relief portrait Am Hof 2. 1912-1914. 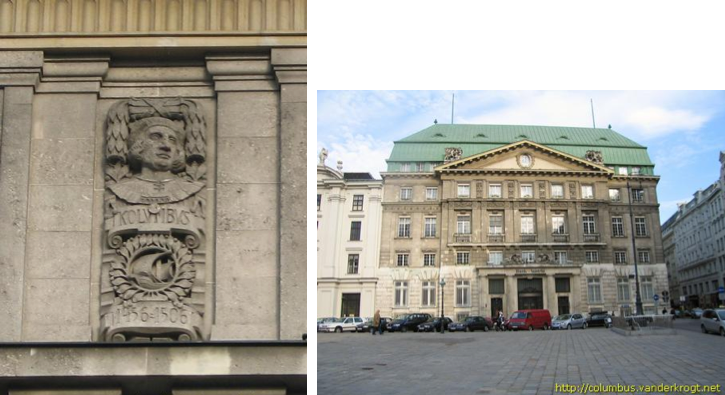 Next to the relief portraits of Gutenberg, Volta and Ressel. Sculptor: W. Heyda. Location: Wien 1, Am Hof 2. 6. 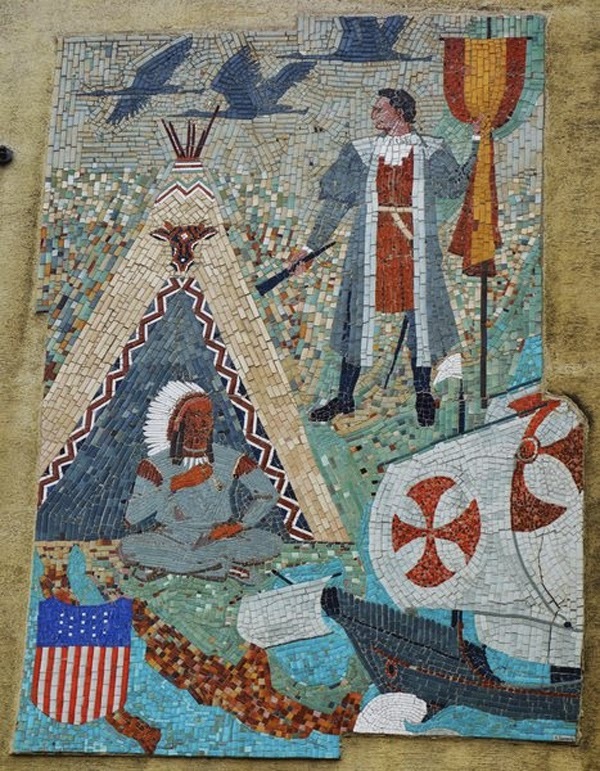 Mosaic at the Columbusgasse, 1966, 'showing a map of North America (Mexico is clearly recognizable at the bottom of the mosaik), with Columbus holding the Spanish flag (standing in the Great Lakes area), one of Columbus's ships, a stereotypic tipi with an Indian chief and the seal of the United States (over Baja California). At the top three large black or grey birds are flying. The mosaik is on the northern façade of the house which was built in 1966'. Sculptor: Emerich Sandig. 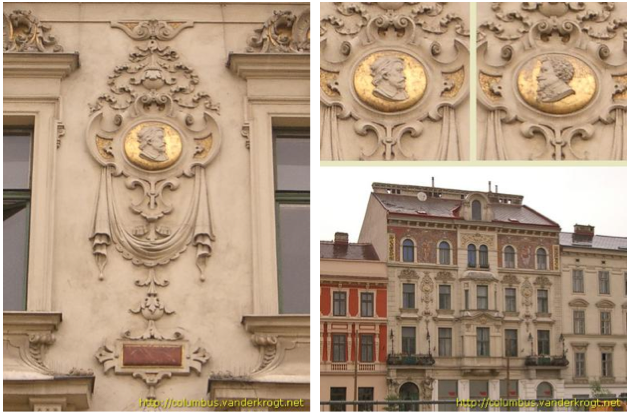 Location: Columbusgasse 66, facing Rotenhofgasse, in Vienna's 10th Bezirk. 7. Columbusplatz. Designed by the architect Ernst Huss. 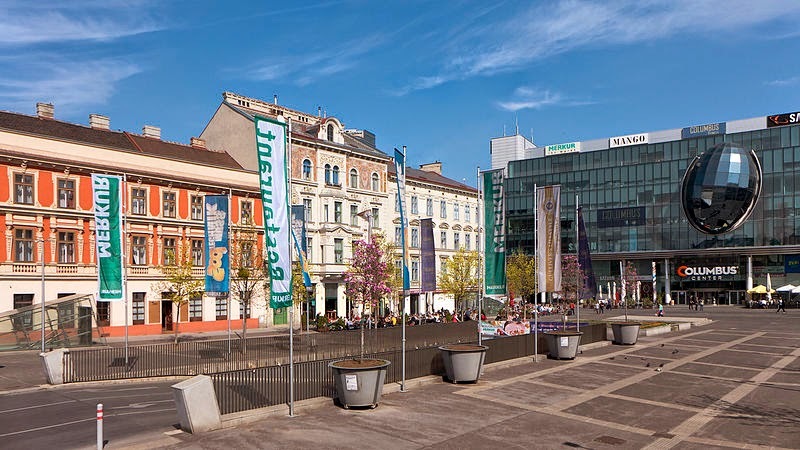 "Columbus Square has become the heart of the Favoriten street." At this square begins the Columbusgasse. 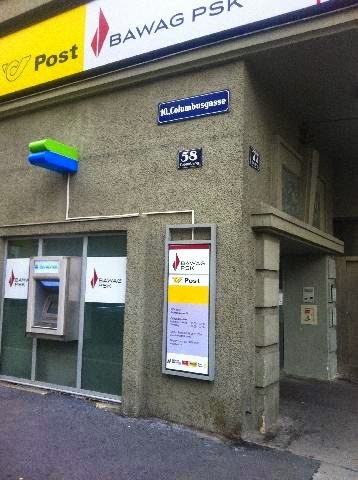 Location: Wien 10, near to Reumannplatz. 8. Columbuscenter at Columbusplatz, features a visible outward steel and glass structure in the shape of an egg, which protrudes from the glass facade. This in reference to the apocryphal story behind the 'Egg of Columbus'. Started on the 12 of October of 2014.